There's Room For More: When the cats away . . . . .
Billy was out of town recently so Robin decided it was the perfect time to do some minor remodeling (and I can't believe I didn't get any before/after pictures). I don't know that I can say the same thing for the man in the parking lot. 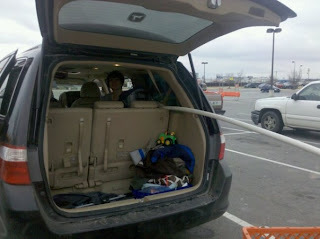 I'm pretty sure he had a good laugh at those ladies with the 3 kids trying to fit 20 feet of PVC in an 8 foot mini-van. I wish I had a camera man following us around because AFV would have paid millions for the footage. While we were in Home Depot Robin asked the lady at the paint counter some questions so Raegen was hanging out in the cart with me. A couple was there with a very small infant boy. I think he was around 2-3 weeks old. I starting telling Raegen how his little brother was going to look like that. I went on and on about how small a baby was and wasn't he cute, etc. Finally after I went on awhile Raegen got this really perplexed look on his face and said "That's my baby brother." I was laughing so hard I could barely answer him. The main project was the hanging of a new curtain rods to make wall to wall curtains. She always has time to pose for a picture. OOPS. I misspelled Raegen's name on the 1st post and I hate that. Good post! Except for the picture of Robin on the ladder. That will take your breath away.